The Great & the Small, by A. T. Balsara. Illustrated by the author. London, Ontario, Common Deer Press, August 2017, hardcover, $31.99 (287 [+ 4] pages), Kindle $4.99. Don’t be scared off by the price. There is also a trade paperback for $14.99. And most of you will get the Kindle edition, anyway. “… in the weak December sun, the harbour city’s popular market was bustling with people looking for last minute presents. Middle-Gate Market was festive with its potted evergreen trees and strands of blinking coloured lights. Shiny red balls trembled on the boughs of the tinsel-dressed pinks as salt air gusted up the hill from the sea below and rattled the lights against the rafters where they were strung. “That was the side of the market the tourists saw and the locals loved. They had no idea of the other side, the one that lay below. A distinct world, with its own ways, its own rules: a colony of rats. Tunnels wound underneath the hill, tooth-carved thoroughfares, veiled from the eyes of humans. There were tunnels high up and tunnels below that snaked deep into the hill’s belly. The Uppers were dug alongside the city’s swanky cafés and eateries, and food was never far away. But lower down the hill, below the heart of the market, it was different. Tangles of narrow tunnels limped through broken pipes, leaking sewers, and sodden earth, connecting scores of foul smelling, crumbling burrows. The Earth Tigers, by Frances Pauli – book review by Fred Patten. Moses Lake, WA, Gastropod Press, February 2017, trade paperback $7.99 (165 pages), Kindle $0.99. The Earth Tigers is Star Spiders, Volume One. Pauli considers it to be s-f, not furry, but it has talking spiders in it. Volume Two, tentatively titled Sky Fires, will be published in 2018. For all the eight-legged beauties, big and small. Unfortunately for reviewing, The Earth Tigers begins in the midst of deliberate confusion and only gradually reveals what is going on. So any traditional plot synopsis would be full of spoilers. It starts with a spider, Horatch, who is looking for a human to become a “candidate”. He (there is a reason for him to be a male rather than a female spider) choses Milyi, a young girl alone in a forest. Light: A Tale of the Magical Creatures of Zudukii, by T. S. McNally. Revised First Edition. Syracuse, NY, Bounding Boomer Books, February 2015; trade paperback $9.99 (158 pages), Kindle $4.99. Since Light is published by print-on-demand technology, McNally has produced a Revised First Edition that corrects many of these mistakes. The date has not been changed, but the original first edition was 151 pages; this revision is 158 pages. The passage that I quoted on pages 136-137 is now on page 143. The specific errors that I pointed out have been fixed; but Garoo still has an unusually prehensile tail for a kangaroo, and the wolves are called canines, not canids. Since most of the errors that I complained about are gone, here is my review again with those complaints gone. “Magical creatures” are the operative words here. I usually divide anthropomorphic fiction into either furry or funny-animal fiction, depending upon whether the anthro animals show some semblance of reality as to species, or whether they are “animal-headed humans”. In Light, though, the inhabitants of Zudukii are totally, blatantly fantastic. It is rare when two characters, say a brother and sister, are the same species, and all are basically humans. A bear has an otter sister, who has a kangaroo boyfriend. Amphibians’ End: A Kulipari Novel, by Trevor Pryce with Joel Naftali. Illustrated by Sanford Greene. NYC, Abrams/Amulet Books, October 2015, hardcover $15.95 ([5 +] 291 [+ 3] pages), Kindle $10.49. Here is the conclusion of this rousing Young Adult trilogy of warfare between the defending poisonous frogs of the Amphibilands and the invading arachnids of the Outback desert. “Frogs and Platypuses versus Scorpions and Spiders”, says the caption in the full-color list of characters. In An Army of Frogs and The Rainbow Serpent, the first and second volumes of this novel in three parts, teenage frog warrior Darel and his friend Gurnugan (Gee) find themselves facing all the adventure they have ever wanted when the desert spider and scorpion armies unite under the latter’s power-mad leader, Lord Marmoo, to invade the lush green Amphibilands. Darel had always wanted to become a Kulipari warrior, one of the band of legendary invincible defenders of the Amphibilands. But the Kulipari had all disappeared a generation ago. 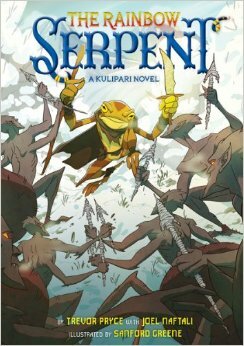 When the endless scorpion armies reappear out of the desert, and Gee is captured, Darel thinks that the Amphibilands’ only hope of salvation is to find where the Kulipari have vanished to and persuade them to return. The Rainbow Serpent introduces little Pippi of the platypus village and her search to find the mysterious frog warrior Darel, whom their elderly seer has had a vision of as being their savior. The book mixes Pippi’s adventures with Darel’s own with the Kulipari. He’s found them – but unfortunately they aren’t as invincible as legend has built them up to be. Can Darel’s joining them restore them to greatness? Foxcraft: Book One, The Taken by Inbali Iserles – Book Review by Fred Patten. Foxcraft: Book One, The Taken, by Inbali Iserles. Illustrated by the author. Map by Jared Blando. NYC, Scholastic Press, September 2015, hardcover $16.99 ( + 252 [+ 8] pages), Kindle $8.87. London, Scholastic Press, October 2015, paperback £5.99 ( + 252 [+ 8] pages), Audio CD £27.70. Foxcraft: Die Magie der Füchse, by Inbali Iserles. Illustrated by the author. Map by Jared Blando. Translated by Katharina Orgaß. Frankfurt, Fischer KJB, September 2015, hardcover €14.99 ( + 252 [+ 8] pages), Kindle €12.99. I won’t guarantee the accuracy of the descriptions of the British and German editions, because I have not seen them. The American cover by Liam Peters is actually a wraparound digital painting, but the back cover portion does not seem to be online anywhere. Foxcraft is another series for Young Adults; recommended for 8- to 12-year-olds or grades 4 to 7. The blurb calls it “The first book in a thrilling fantasy trilogy”, so we know that it will be only three novels. The Familiars, by Adam Jay Epstein & Andrew Jacobson – Book Review By Fred Patten. The Familiars, by Adam Jay Epstein & Andrew Jacobson. Illustrations, map by Peter Chan & Kei Acedera. NYC, Harper CollinsPublishers/Harper, September 2010, hardcover $16.99 (360 pages), Kindle $4.99. The Familiars: Secrets of the Crown, by Adam Jay Epstein & Andrew Jacobson. Illustrations, map by P. Chan & K. Acedera. NYC, Harper CollinsPublishers/Harper, September 2011, hardcover $16.99 (374 [+ 1] pages), Kindle $4.99. The Familiars: Circle of Heroes, by Adam Jay Epstein & Andrew Jacobson. Illustrations by Greg Call; map by P. Chan & K. Acedera. NYC, Harper CollinsPublishers/Harper, September 2012, hardcover $16.99 (327 pages), Kindle $4.99. The Familiars: Palace of Dreams, by Adam Jay Epstein & Andrew Jacobson. Illustrations, map by Dave Phillips. NYC, Harper CollinsPublishers/Harper, December 2013, hardcover $16.99 (323 pages), Kindle $6.99. The Warriors series of talking feral cats by “Erin Hunter” is known to furry fandom, but most of the other anthropomorphic animal series for the 8- to 12-year-old market seems to be ignored, except when one of them is adapted into a CGI animated feature. The 15 The Guardians of Ga’hoole novels of anthropomorphized owls by Kathryn Lasky, which became the 2010 animated movie Legends of the Guardians: The Owls of Ga’hoole by the Animal Logic studio and Warner Bros. distributor, is one example. Here is another, maybe. The first novel in the four-book The Familiars series, published in 2011, announces “The Familiars will be produced for film by Sam Raimi and Sony Animation.” As of 2015, Sony says the film is still in development, although Sam Raimi no longer seems to be associated with it. The series is aimed at 8- to 12-year-olds; the upper primary school grades. It is set in a magical world. The three familiars are Aldwyn, a young cat; Skylar, a girl blue jay; and Gilbert, a tree frog. Guardian Cats and the Lost Books of Alexandria, by Rahma Krambo – Book Review By Fred Patten. Yuba City, CA, Reflected Light Books, July 2011, trade paperback $6.99 (261 pages), Kindle $2.99. This is an attractive and easily-read fantasy for Young Adult and adult cat lovers, announced as the first in a series. It emphasizes “magical realism” rather than any s-f or fantasy nature. The animals can just talk, that’s all. Marco is a pampered young housecat who learns to read when his human, young Lucy, leaves books out where he can get at them at night. Soon he is lost in what Lucy likes to read, which is Young Adult adventure and fantasy. The reader will recognize The Lion, the Witch, and the Wardrobe and The Three Musketeers. “In the wee hours of the night, Marco became a warrior, a wizard, a wanderer, but he was always the hero. When Marco read, he forgot he was a cat.” (p. 2) An emergency – the reader will recognize Lucy’s grandmother being rushed to a hospital – empties the house of humans. After a couple of days alone, Marco ventures outside. Last of the SandWalkers, by Jay Hosler – book review by Fred Patten. Last of the SandWalkers, by Jay Hosler. Illustrated by the author. NYC, First Second, April 2015, trade paperback $16.99 ([5 +] 312 pages), Kindle $9.99. Biologist/entomologist/cartoonist Dr. Jay Hosler has been creating comic books and cartoon-art books since the 1990s. He may be best-known for his award-winning Clan Apis, a dramatic adventure featuring honeybees that was also (allowing for the anthropomorphization) entomologically accurate; first published as a five-issue comic book in 1998 and still in print as a graphic novel today. 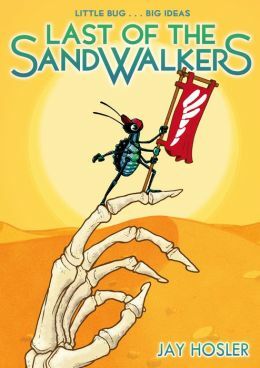 Now Hosler has written & drawn Last of the SandWalkers, a science-fiction comedy-drama for readers 10 and up, featuring beetles, for First Second, a subsidiary of publishing giant Macmillan. The main characters are a scientific expedition of five beetles, all different: Lucy (shown on the cover), a sassy, rule-breaking junior member and a water-capturing tenebrionid beetle from the Southern African desert; Professor Bombardier, the motherly stable team member, a bombardier beetle; Mossy, a giant but unassuming Hercules rhinoceros beetle; Raef, a not-very-bright (mentally) firefly; and grumpy Professor Owen, a small but nasty Cape stag beetle. They are from New Coleopolis, a beetle city under a palm tree in an isolated desert oasis. New Coleopolis was founded a little over a thousand years ago, after old Coleopolis was destroyed by cocoanuts falling on it from the palm tree. It was assumed at the time by religious leaders that the god Scarabus had caused the falling cocoanuts due to displeasure at Coleopolis’ scientific community’s iconoclastic spirit, and since then the new theocratic city has outlawed research. This expedition is the first in a thousand years. The Guardian Herd: Stormbound, by Jennifer Lynn Alvarez – book review by Fred Patten. The Guardian Herd: Stormbound, by Jennifer Lynn Alvarez. Illustrated by David McClellan; map. NYC, HarperCollinsPublishers/Harper, April 2015, hardcover $16.99 ([xiii +] 299 [+ 1] pages), Kindle $8.89. Well, this is a big surprise! 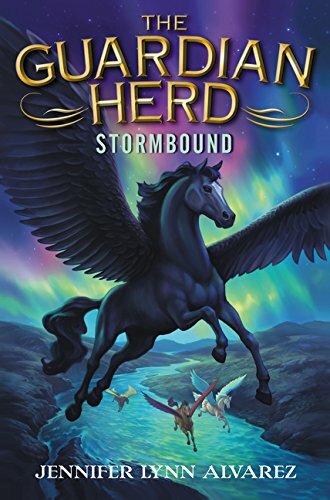 The Guardian Herd: Starfire, the first book in this series, listed 32 flying and talking horses in five herds. Others were mentioned during the adventure of the colt Starfire’s maturing to the over-stallion of his own herd. The obvious assumption was that this first sequel in a promised long series would switch to another pegasus named Stormbound. Instead, The Guardian Herd: Stormbound continues directly from where the previous novel ended. Stormbound isn’t the name of a pegasus; it’s the title of the second adventure. The Guardian Herd: Starfire ended with Starfire (a.k.a. Star), the first all-black (except for the white star on his forehead) stallion in four hundred years, reaching his first birthday without being killed, coming into his power from the Hundred Year Star; and leading his followers – mostly yearlings like himself, plus older pegasi dissatisfied with the leaderships of the existing herds – into a new River Herd. As The Guardian Herd: Stormbound opens a month later, Star is still looking for a permanent territory for his new herd, away from the five hostile older herds. He has declined to become an over-stallion and has entrusted the River Herd to the guidance of a council of six more experienced pegasi; although the council consider themselves more as advisors under his leadership.